Submitted by Dave Piske. Photo by David Coulson. Early in August of 2007, Heather Knight, The Nature Conservancy’s (TNC) Project Director at Phantom Canyon, advised Scott Baily, her prime RMF contact for volunteer support to the Phantom Canyon Preserve, that there were several areas on the river trail where vegetation had grown up and needed to be cleared. With the third and fourth River Adventure Days scheduled for September 8 and 9, it was important that this be attended to soon. Scott and Heather scheduled a work day for Saturday, August 25. Scott recruited 9 RMF TU members who volunteered to do the work. As many of you know, Scott is temporarily unable to participate in such physical work because of recent orthopedic surgery. As a result, Dave Piske stepped in to organize the on-site efforts. The other volunteers were: Richard Bader, Frank Cada, David Coulson, Bob Holmes, Jim Lilly, Guy Turenne, and Phil and Logan Wright. For four of this group, it was their initial trip into Phantom Canyon. 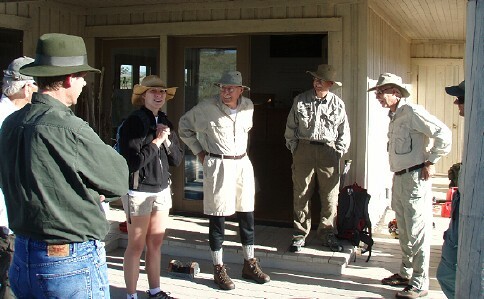 The group was greeted at the gate to the Preserve at 7:30 AM by Jenni Mullins, the TNC Outreach Intern this summer. Upon reaching the visitor center, the volunteers formed into two teams, one to do trail clearing on the downstream reaches, the other to do the upstream reaches. Frank Cada lead the downstream team and Dave lead the upstream team. Each team took the necessary tools that had been prepared and laid out by Jenni, and then headed down the canyon trail, accompanied by Jenni who joined one of the teams until noon when other duties required her to return to the visitor center. On reaching the river trail, both teams found there had been abundant growth of riparian vegetation, including the infamous poison ivy in certain areas. They proceeded to vigorously clear the overgrowth, especially near stream crossings. Having been warned of active bears being recently sighted along the river, precautions were taken to give plenty of warning about the teams' presence. As it turned out, the bears had completed their harvest of choke cherries and other berries. They seemed to have departed for other territories, leaving only a plethora of tree branches pulled down and broken to facilitate their stripping of fruit. It was obvious that, had the workday taken place a week or two earlier, there would have been encounters of a different kind. Trail clearing was completed about noon, with the RMF volunteers having contributed about 40 man-hours of work. Their labor was then rewarded by the opportunity to fish for the next several hours. The river water was on the verge of being too warm and was quite turbid from rains earlier in the week, so conditions for catching were not ideal. But some trout proved willing to take large attractors on the surface or woolly buggers and bright nymphs subsurface. Regardless of the physical work involved and the less than ideal fishing conditions, simply inserting ourselves into the rugged beauty of this pristine canyon produced a refreshing adventure. 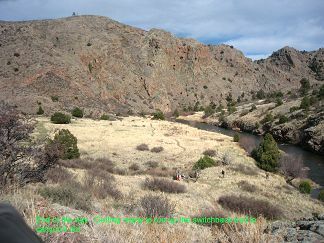 On April 1 and again on April 15, 2006, volunteers from the chapter conducted two days of trail maintenance on the foot-trail that follows the 6-mile course of the North Fork of the Poudre River through The Nature Conservancy's Phantom Canyon Preserve. 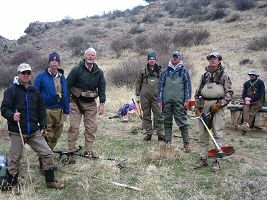 These workdays were part of a continuing cooperative arrangement between Trout Unlimited, represented by the Rocky Mountain Flycasters, and The Nature Conservancy. 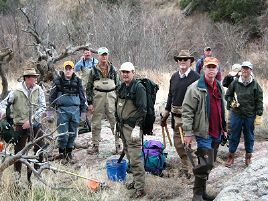 Another element of this cooperative arrangement is the Phantom Canyon River Adventure Days by our TU chapter and the Nature Conservancy (see Phantom Canyon). The trail maintenance crews were organized and lead in the field by TU member Scott Baily who coordinated the activities with Heather Knight, The Nature Conservancy's Laramie Foothills Project Director. The work included reconstructing rock cairn trail markers, clearing of vegetative growth around the cairns, trimming of shrubs and tree branches encroaching on the pathway and clearing of deadfalls across the trail. Eleven TU members participated in the April 1 workday including Dave and Matthew Cranor, Paul Prevost, Mike Frey, Scott Baily, Milt Mays, Justin Shannon, Jim Bolick, Tom Mazarissi, Phil Wright, and Dave Piske (photographer.) Six TU members (Tom Mazarissi, Jim Bolick, Milt Mays, Scott Baily, Justin Shannon, and Dave Piske) returned and were joined by Mike Frey and Jim Schmehl on the April 15 workday. Maintaining the river trail in good condition is obviously helpful to the conduct of the Public Fishing Days in the canyon, but the trail is also utilized by many of the guided interpretive hikes on diverse ecological topics conducted by The Nature Conservancy. Among the topics to be covered during hikes scheduled for this season are: migratory songbirds, rare botanicals along the East rim, wildflowers, geology of the canyon, lichens on the cliffs, ecology of the aquatic and riparian systems, and aquatic insects of the North Fork. For those interested in learning more about The Nature Conservancy work being done in Phantom Canyon and other Conservancy preserves in Colorado, please visit http://www.nature.org/colorado. Additionally, the April issue of the Phantom Phlyer, the Conservancy's newsletter about Phantom Canyon events and volunteer activities can be forwarded to you. If you're interested in having the April edition forwarded to you, contact either Scott Baily or Dave Piske. Visit W3C and CSS for standards compliance. Best viewed with web-compliant viewer.